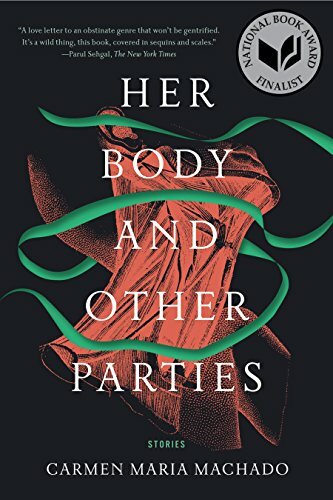 Carmen Maria Machado’s debut collection, Her Body and Other Parties, is compelling, gloriously weird, and, though some of the narrators are occasionally deeply frightened, the stories collected are nothing less than fearless. Genre and gender bending, erudite and steamy, Machado’s stories manage to defy expectation and be compulsively readable. In the near perfect short story, “Real Women Have Bodies,” a mysterious disease is literally erasing young women: They slowly fade until they disappear. Given that the narrator works at an upscale dress shop where two jockish men like to stand at the door and cat call at the women trying on the wares, the story seems like it will be parable of our culture’s impossible, photo-shopped expectation of women’s bodies and the inevitable lengths women go to please the eyes of men. The story “Inventory” is also fantastically unsettling, with a narrator counting all her lost loves, and in the course of her mathematics, reveals the history of a plague that has devastated America. “Eight Bites” is also more complicated than it originally seems. The narrator decides to get bariatric surgery after seeing her sisters emerge svelte and happy from the procedure. But as much as it divests her of her excess weight, the surgery irrevocably destroys her relationship with the daughter who shares a similar body-type, and the narrator is haunted by the self/selves she has cut away. “The Resident” is a contemporary reimagining of The Shining, laced with bohemian ‘poet-composers’ and Girl Scouts. A few stories miss their mark, perhaps because the author’s virtuoso skills are too much on display. “Especially Heinous,” attempting to lambast America’s obsession over sexual crimes and television procedurals, feels like it is trying hard to dazzle, clocking in at forty pages of re-imagined Law & Order episodes. “The Husband Stitch,” though riveting, is occasionally too artful, with stage-direction author asides that tug the reader out of an otherwise thrilling story. These are dark and fabulous tales, hypnotic and throbbing, stories that somehow both celebrate female sexuality and yet make the reader constantly uncomfortable, voyeurs peering too close at another’s desperate intimacy. But that is why these stories are so successful, they launch the reader into a realm rarely seen in fiction, and the journey, at times discomfiting, is always exhilarating. Siobhan Fallon is author of You Know When the Men Are Gone, named a best book of 2011 by Janet Maslin of The New York Times, San Francisco Chronicle, and others, and is a winner of several literary awards. Her latest novel is The Confusion of Languages, which will be published in June 2017.